I always garden. I love it. I think I started based on my father who was a gardener. I’ve always had a garden. I’ve owned my own home since 1980, and I’ve always had a yard to take care of and just enjoy it. To go outside and get some satisfaction out of seeing it when it’s in bloom is why I do it. Who or what inspired you the most towards gardening? I think, like I said, that would be my father. My father was a gardener and it’s kind of an interesting story. He and his brother owned a flower shop just before World War II broke out. Back in that time, it’s hard for people to think this could happen, but the government came in and told he and his brother that they had to shut down the flower shop because it was “deemed non-essential” to the war effort. We had to close his flower shop and went to work at Colt Firearms in Hartford making guns to support the war effort. He had to give that up, but he always kept his interest in flowers and gardening. Just seeing him my whole life working in the yard and loving it, I guess is what inspired me. 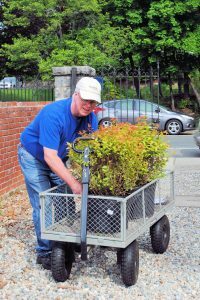 What’s your major challenge as a gardener? Dealing with the animals and stuff that come in the yard that brought in rabbits and woodchucks and deer and all these things. Even though Longmeadow isn’t out in the woods, you don’t think of it as being a problem. It’s not a very rural area you can expect to have [pest] problems. Even Longmeadow still has deer and a lot of animals that come in the yard. They are just looking for something to eat. They like some of the plants in the air and so it’s frustrating. So, you spend a lot of money on the plants. You spend a lot of time getting them in the ground fertilizing them and then you go out one morning it’s something it’s just right down to the ground. It’s mostly dealing with the pests, other insects, or animals in the garden, I guess that’s probably the biggest problem. Yeah. I don’t have a vegetable garden. A lot of people, when they think of gardening, they think of vegetables. I don’t have enough room or no sunlight in my yard for vegetables, which require a lot more sunshine, but I do have flower beds around the yard. What grows in your dream garden? I never thought about that really. Something you can’t grow around here, but I guess I don’t think of it that way. I like Iris, it’s one of my favorites, Iris. I have them in my yard, so it’s not just a dream garden. For the most part, I like hollyhocks, forsythia, lilacs, a lot of things like that. Alyssum is another that I love, and it’s blooming in my garden today. Describe your experience gardening at Wistariahurst. It’s been interesting. It’s great because you get to see a lot and take care for a lot of plants that I don’t have in my own yard. You know they have a lot of these rose bushes and stuff, so you get to learn a lot about different plants that I that I don’t have. I work with a group of nice people. Everybody here is nice, and we have a good time we come in, garden, we take a break. We sit down and talk. It’s not just to go out there and pull weeds all the time. It’s satisfying to look out there and see this beautiful garden that you’ve helped take care of. The volunteer experience part of it is good for me. I like getting a good feeling from volunteering here. 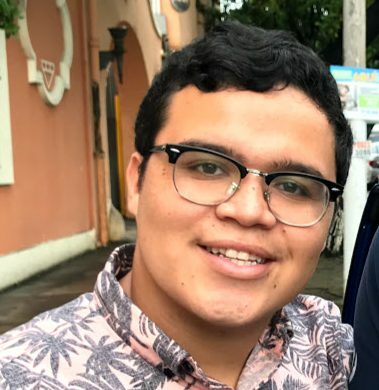 Antonio Quiñones Negroni is a student at University of Puerto Rico-Mayagüez at his second year of internship at Wistariahurst Musuem. Antonio loves to find creepy objects in the corners of the museum.